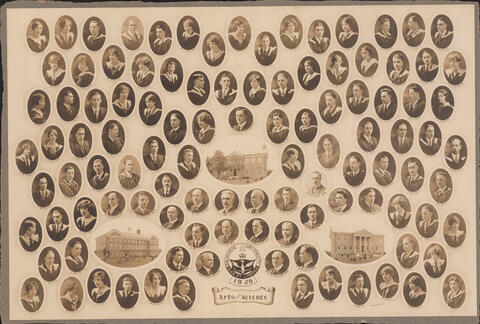 Item is a composite photograph of the 1926 facutly and class of the Dalhousie University faculties of Arts and Science. The photograph consists of portraits of J. S. Dresner; E. V. Morris; J. A. Hochin; A. M. Down; C. J. Wickwire; M. A. FitzRandolph; M. A. Mosher; K .M. Hines; H. A. O'Connor; F. C. Page; M. I. Thompson; D. G. Berry; D. C. Morton; H. G. Peveril; A. 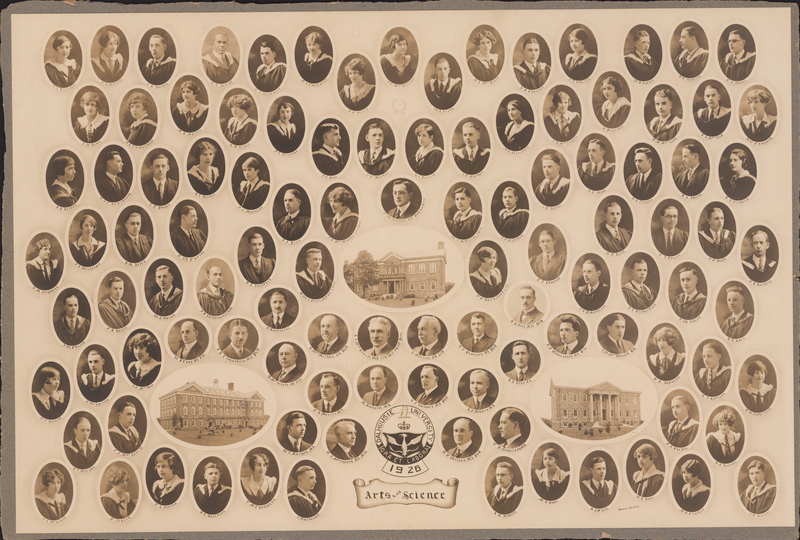 B. Thomson; S. C. Gordon; M. E. Beresford; J. H. MacIntyre; H. Pearson; G. M. MacLeod; R. H. MacLeod; M. E. Campbell; A. C. MacKinnon; W. A. Firth; B. D. MacPhail; I. H. Roberts; W. D. Outhit; R. B. Woodill; C. B. Moore; P. R. Hilton; O. F. C. Armstrong; T. E. Dwyer; A. L. Morton; C. I. Macneill; A. F. Price; F. R. MacMullen (Life Vice President); G. W. Nichols (Honorary President); W. J. McCurdy (Life President); J. E. Mitchell; J. E. Horne; J. F. Shaw; B. R. Tupper; P. A. Lovett; R. S. Vickerey; D. M. Stephens; F. J. Messenger; R. W. Allen; C. W. Currie; H. K. Sandford; G. W. I. Creighton (Life Treasurer); E. G. Barnstead (Life Secretary); J. L. Atwood; G. E. Kent; C. J. Tanner; C. E. Doyle; C. R. Buckley; J. W. Church; F. R. Hayes; W. G. Moran; J. D. Lachhmansingh; R. Gautheron; A. MacMechan; A. S. MacKenzie (President); H. Murray; H. L. Bronson; H. P. Bell; J. H. Matheson; A. L. Richardson; J. W. Byers; R. R. Ross; E. C. Hallett; C. W. Sperry; J. C. MacRae; W. P. Copp; J. H. L. Johnstone; D. MacIntosh; C. H. Mercer; M. Macneill; W. A. Maxwell; D. S. MacIntosh; I. Macdonald; E. M. Thompson; H. A. Davidson; E. H. Morton; E. Jensen; B. S. McKenna; A. L. Murphy; C. F. MacKenzie; H. L. Stewart; H. F. Munro; H. S. King; J. N. Gomanlock; J. M. MacDonald; C. F. Johnson; G. J. Redmond; E. M. Sutherland; G. E. Wilson; C. B. Nickerson; A. R. Jewitt; M. D. Robb; A. S. Cook; V. H. Knox; M. B. Crocker; J. G. Godsoe; R. A. Hayman; and F. J. Forbes arranged in several rows around photographs of three buildings and a crest. Photograph is faded and is mounted on a matboard. Matboard is very worn around the edges.